I did my college application essay on Red Rising. It contains some of what I got out of the story, and I'm posting here in the hope that others will be able to relate. Please enjoy. “I would have lived in peace. But my enemies brought me war” (p. 1). I know this epic, I’ve read it many times, and yet I get chills as I read these first words again. I find it hard to say whether that is due to good writing or anticipation of a story I’ve come to love, but likely both. There are many lessons to be found within the pages, and each time I venture back into the story I get something new out of it. Red Rising is not a friendly tale of easy victories, fantastic powers, and unstoppable heroes, but rather one of tragedy and hardship. Plans go awry, tides quickly turn, and loved ones are lost. In our modern world where ever-victorious superheroes are plastered onto every facet of media, we grow bored with the predictable outcomes and the perfect lives. They are a fun, temporary escape from our reality, but there is little to be learned from that type of media, and the magic fades with repetition. With real danger in a story, we get to excite our imagination again - there is a risk of something gambled, an outcome desired, and the odds of loss ever-present. In the right mindset, even these losses become lessons, without which we would gain nothing, having no contrast to make the victories sweet. It's easy to see why a story that doesn't shy from reality could be so intoxicating. Pierce Brown let's the reader fear for the characters they love in the way his protagonists do; when everything is looking so right it always has the possibility of going to wrong. He lulls his readers into feeling comfortable enough to relax, just before he inserts a cureve into the story that reframes everything thus far. Brown weaves this magic with a lovable, human cast and meticulous world-building, resulting in one of the strongest creative works I have had the pleasure of reading. 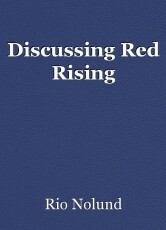 Red Rising is a story about a young man - Darrow of Lykos - forced to become a leader. He and his people are pioneers and colonists on Mars, toiling in mines to make the planet livable for future generations. The rulers assure them they will be respected and admired by the people who will enjoy the fruits of their labor. He soon finds himself enlightened by a terrorist organization that shows him a completed Mars, replete with cities and people. The society’s ruling body had no plan of ever bringing them to the surface, intending to always keep them as ignorant slaves. This revelation ignites within him the realization that the caste system must be removed for all to live free, and he is the one to lead the monumental change. Darrow now must grapple with the resulting question: How does an individual shift the mentality of an entire society? He realizes his will alone will not be enough; he must have a coterie of people willing to aid him in his mission, and those people need a leader. Darrow is constantly juggling the power of influence, trying to win the loyalty of those around him, and ensure lasting brotherhood that goes beyond the temporary structure he’s a part of. While many around him control with fear, punishment, and rule, he influences through an intense bond few are willing to emulate. Darrow knows that fear is an ineffective path to government, and a broken one when it comes to loyalty. As he starts to form this band of followers, there’s a moment when he is faced with a lose/lose scenario cleverly orchestrated by one of his own men in an attempt to challenge Darrow’s authority. The man has committed an injustice against an enemy, and Darrow’s choice lies between punishing his man in front of others and fueling a mutiny, or letting his man get away with unacceptable behavior, thus weakening his own leadership. Darrow invents a third alternative, lashing the man for his crime, and then asking to receive the same lashes from someone stronger than himself. It’s a brilliant display of self-sacrifice and shows his fledgling army that their failures and successes are not theirs alone. After he has stood up ragged and bloody, he turns to his people and gives the following speech, “You do not follow me because I am the strongest. Pax is. You do not follow me because I am the brightest. Mustang is. You follow me because you do not know where you are going. I do” (p. 304). It is only through powerful writing and meaning like this that a story can impact me as deeply as it has. Red Rising has made me ask what is necessary for human survival. How far are we willing to go, what must be done, and who are we willing to become in the pursuit of a better future. I feel that we live in a deeply flawed society, between our education system, our government, our relationships, and societal roles. Like an Olympic-class ocean liner headed towards an iceberg, I fear there is no way we will be able to turn fast enough or far enough to avoid self-destruction unless we shed massive amounts of bureaucratic weight along the way. But how do we manage to remove the bureaucratic tyrants we oppose, without becoming them ourselves? To overlook these questions is exactly how to become the very thing I oppose. I don’t know the answers; the story alone hasn’t gifted me with that much insight. However, Red Rising is the first book that makes me believe that change on a massive scale is possible; it enlightens me with real-world guidance as to how I would implement societal shifts myself. In short, Red Rising has caused me to think bigger in a way no other book has thus far. © Copyright 2019 Rio Nolund. All rights reserved. well written essay - misses some of the point of what Brown was trying to say tho I think. You're right! There are so many lessons within his story that I wish I could have gone more in-depth and tackled some larger themes. This essay is a college application, they asked, "In your eyes, what makes this story great? How has it impacted what you think or how you think?" If I had the freedom I would have gone into slavery (colors), morality (the evils Darrow must commit), Darrow's humanity (when he makes bad decisions), equality (of course being colorless), narrow-mindedness (their view on autonomous robots), etc.